Rachel Cruickshank, founder of Barcelona Fun Science, designs interactive science workshops. On 25 April, IRB Barcelona held an interactive training workshop on science communication, in partnership with Barcelona Fun Science—an enthusiastic group of people who meet regularly to explore scientific ideas through social and interactive activities and play sessions. Entitled "Interactive Approaches to Engage Curious Adults", the activity was led by Rachel Cruickshank, Founder of Barcelona Fun Science, and was organised with the support of FECYT. Aimed to give IRB Barcelona researchers tools with which to communicate and discuss scientific concepts effectively, the session helped participants to understand the needs of adult audiences when dealing with science communication and engagement activities. Finding out how to clearly transmit scientific concepts, identifying areas of potential miscommunication, and creating demonstrations and games for discovery learning are some of the multiple activities that Barcelona Fun Science prepared for participants in its unique interactive workshop. This initiative forms part of the Institute’s public engagement activities and “represents a great opportunity for researchers to take a step forward in communicating science to the general public by understanding audience motivation,” highlights the organiser of the workshop Muriel Arimon, Public Engagement and Science Education Officer at IRB Barcelona. During the session, participants learnt how to use science-play to talk to adult audiences. “It made me realize the amount of jargon that we use without realizing and that this might make communication harder. I really liked the activity of trying to describe a cell without using words such as mitochondria.There are words we are so used to using that we don't realise they aren't common,” explains Daniela Ferreira Romao, PhD student with the Development and Growth Control Laboratory at IRB Barcelona. “We are so used to doing workshops with kids that at some point I realized that I had trouble with oversimplifying when I was talking to adults. Attaining a balance where adults do not feel that talks about science ‘are too hard’ and at the same time opening up the possibility for them to ask questions without feeling ashamed is one of the hardest things, and I felt that this training would help me achieve this equilibrium,” stresses Romao. She adds, “This type of course will make us better scientists and improve our soft skills”. 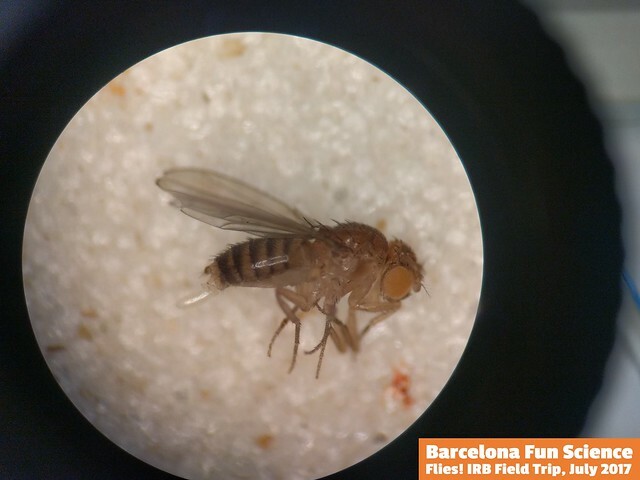 Through collaboration with IRB Barcelona, Barcelona Fun Science offers an opportunity for researchers to get involved in community science engagement events and presentations held in English in Barcelona. On 11 July, postdoctoral researcher Panagiotis Giannios led a Barcelona Fun Science Meetup at the Institute. He engaged participants in how scientists use the fruit fly Drosophila melanogaster as a model system and why it is so important in biomedical research.